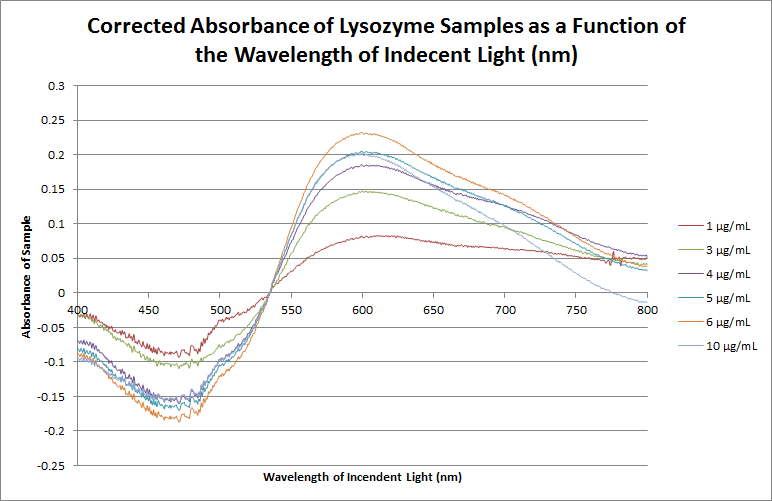 The goal for the day was to perform a Bradford Assay analysis on Lysozyme using UV-VIS and generate a calibration curve. The instructions for the day can be found here with additional instructions on the Bradford Assay here. A change from the original instructions is that the samples created would be 3 mL, not just 1 mL. 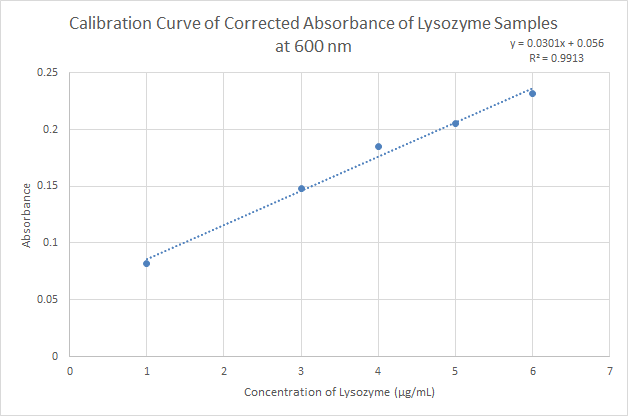 Also, 25 mg of lysozyme was added to a total of 5 mL of buffer. This graph shows the absorbance of the samples as function of the wavelength of incident light. 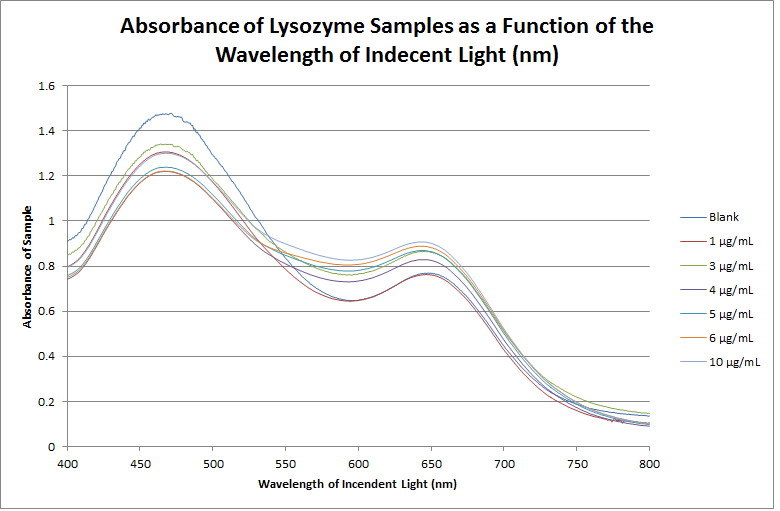 The raw data for the six Lysozyme samples and blank are shown. This graph shows the absorbance of the samples as function of the wavelength of incident light when corrected. The six samples were first corrected for by subtracting the absorbance of the blank from every wavelength of the samples. Then, the isosbestic point at 535 nm from each samples was subtracted from all the wavelengths of that sample. 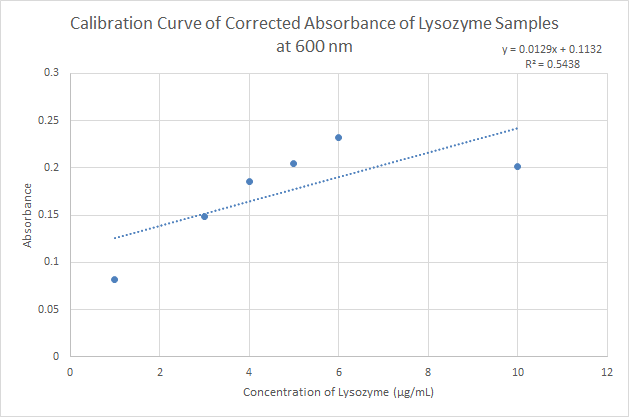 This graph shows the calibration curve for the absorbance of the samples as function of the concentration of Lysozyme in μg/mL. Each peak shows the corrected absorbance of the sample at 600 nm. It is noticed that 10 μg/mL point deviates from the general trend, affecting the R2 value. This graphs shows the same information as the graph above except for the remove of the 10 μg/mL sample. The R2 value increases significantly.